Jetset Plumbing provides a Water Efficiency Certification service for Owners, Landlords, Real Estate Agents and Lessors. In order for a tenant to be charged for the water they use the property must be Water Efficient, our Licensed Plumbers can inspect your property and convert your fixtures and fittings to be Water Efficient if required and provide a Water Efficiency Certificate. Simply call us today. Lessors and landlords are allowed to pass on the full water consumption charges to tenants provided all the minimum requirements are met. According to the RTA Queensland to charge a tenant for water the property is required to be individually metered and the premises is water efficient. The tenant cannot be charged more than the amount charged by the authority supplying the water service. The tenant may only be charged if the tenant, lessor, agent and or manager have agreed in advance how a contribution is calculated and paid. A rental premises is water efficient if particular fixtures and fittings meet the minimum requirements. Internal cold water taps and single mixer taps (excluding bath taps and taps for appliances such as fridge, dishwasher or washing machine) Maximum flow rate of 9 litres per minute. Showerheads Maximum flow rate of 9 litres per minute. Toilets must be dual flush no greater than 6.5 litres full flush and 3.5 litres half flush and a maximum average flush volume of 4 litres (based on the average 1 full flush 4 half flush). The requirements for taps only applies to internal cold water taps that are installed over a hand basin, kitchen sink or laundry trough (including single mixer taps). The requirement does not apply to other taps in the premises such as bath taps, outside garden taps, or taps with supply washing machines, dishwashers or fridges. These taps are not required to be water efficient. Warranties or instruction manuals for taps and showerheads etc. For any water fixtures produced from 2005 onwards you can easily check if they meet required efficiency standards by looking at products WELS rating of three stars or higher. 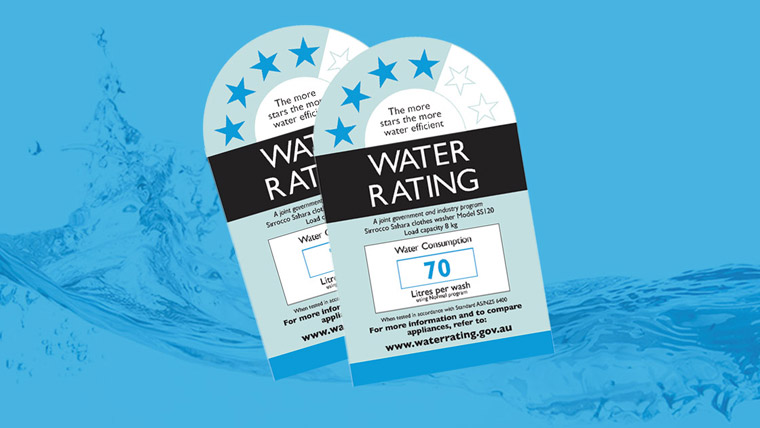 WELS is Australia’s water efficiency rating system which includes taps, showerheads and toilets, the more stars the higher the efficiency.